Allen surgeon, Dr. Kaaki, is specially trained with da Vinci. If you or a loved one has been diagnosed with a condition that may require surgery, you owe it to yourself to learn about all of your medical options, including the most effective, least invasive surgical treatments available. With Allen's da Vinci robotic surgery you can expect significantly less pain, less blood loss, less scarring, shorter recovery time, a faster return to normal daily activities, and in many cases, better clinical outcomes. 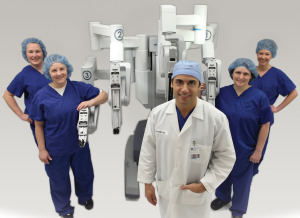 We've been the leader in robotic surgery in Waterloo since 2010 performing the most robotic surgeries in the Cedar Valley.